NEW ORLEANS –The fields are set for the NCAA Division I Outdoor Track & Field Preliminary Rounds this weekend in Sacramento, California, and Tampa, Florida. 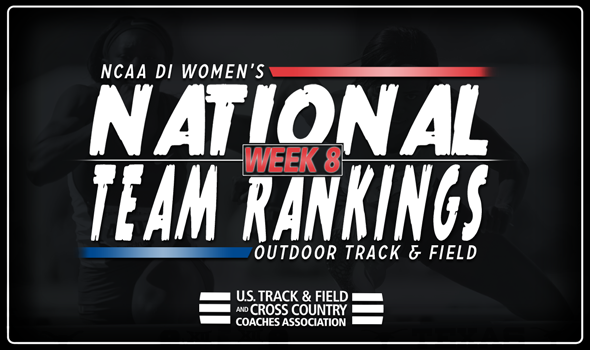 Using solely the entries into this penultimate round of track & field, the newest round of National Team Rankings released by the U.S. Track & Field and Cross Country Coaches Association (USTFCCCA) on Monday showed very little change from last week’s batch of rankings. Southern California and LSU remain atop the heap in first and second place, respectively, while Georgia managed to jump up two spots to third. The Bulldogs may only feature 18 entries into the East Prelims, but those 18 carry a lot of weight. Two Watch List members for The Bowerman in Lynna Irby (200) and Keturah Orji (long jump and triple jump) lead the NCAA in their respective events, as does Tatiana Gusin (high jump). The Bulldogs jumped all around the top-10 after ranking third during the preseason, but return to third ahead of the East Prelims. Southern California’s Kendall Ellis – another Watch List member for The Bowerman – is a big part of the Trojans’ first-place ranking, as she sits atop the Descending Order List in the 400. The Women of Troy also have seven other top-10 Descending Order List marks in the sprints and hurdles, as well as two top-10 relay teams. LSU, much like Southern California, will enter the weekend with a plethora of athletes in the top-10 of the sprints and hurdles. Aleia Hobbs leads the way for the Tigers, as The Bowerman Watch List member owns the top 100 time this year while also anchoring the nation’s top 4×100 relay time. Texas A&M and Oregon round out the top-five, and both programs will enter the prelims with an NCAA Division I-leading 32 entries apiece. Jasmine Fray enters the weekend with the nation’s top 800 time for the Aggies. Oregon doesn’t have an athlete or relay team that leads the nation in any particular event, but the Ducks are well-rounded with 14 sprints/hurdles entries, 10 distance/mid-distance entries and six field event entries. The bottom half of the top-10 didn’t undergo too much of a change, either. Stanford managed to move up one spot to sixth, knocking Kentucky down to seventh. The Cardinal have the third-most entrants of any women’s program with 28, while the Wildcats boast 19 entries. Florida (eighth), Arkansas (ninth) and Tennessee (10th) round out the top-10. The Gators and Razorbacks will head to the prelims with 21 entries each, while Tennessee will bring 20 down to Tampa.